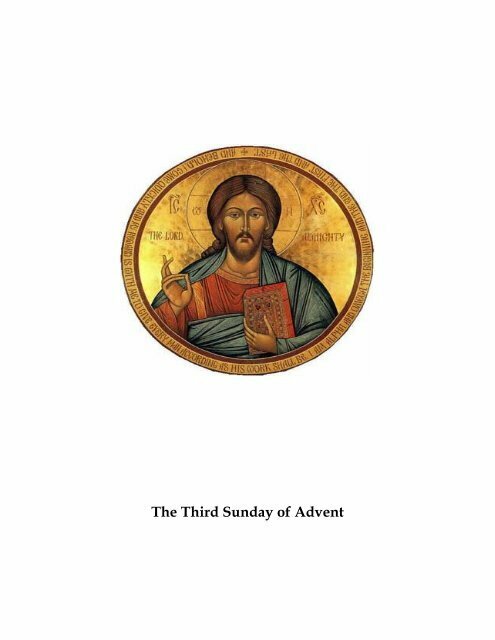 The Third Sunday of AdventTone III(Rose, Blue or Purple)The Introit Philippians 4: 4-6; Psalm 85 TONE IIIa ff k k k i k k k k j i k k j jAntiphon:Rejoice in the Lord al-ways; *again I will say, Rejoice!Let your gentleness be known to everyone. *The Lord is near.Do not worry a-bout anything, *but in everything by prayer and supplication withthanksgiving, let your requests be made known to God.Psalm:1 You have been gracious to your land, O LORD, *you have restored the good fortune of Jacob. [4 Restore us then, O God our Savior; *let your anger depart from us.5 Will you be displeased with us for ever? *will you prolong your anger from age to age?7 Show us your mercy, O LORD, *and grant us your salvation.8 I will listen to what the LORD God is saying, *for he is speaking peace to his faithful peopleand to those who turn their hearts to him.9 Truly, his salvation is very near to those who fear him, *that his glory may dwell in our land.